Off they go again. 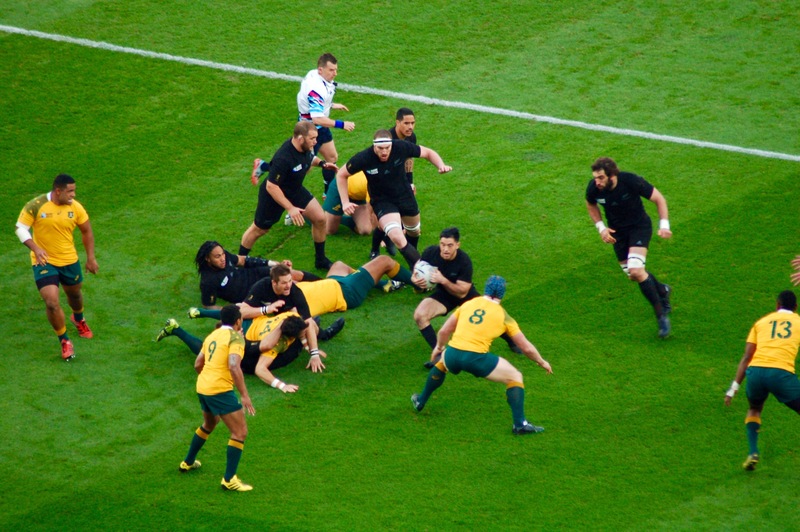 The New Zealand All Blacks cut through the Australia defense in the Rugby World Cup Final. One thing that struck me as I edited my photos from this match: Richie McCaw, the New Zealand captain, is in almost all of them, always around the ball. 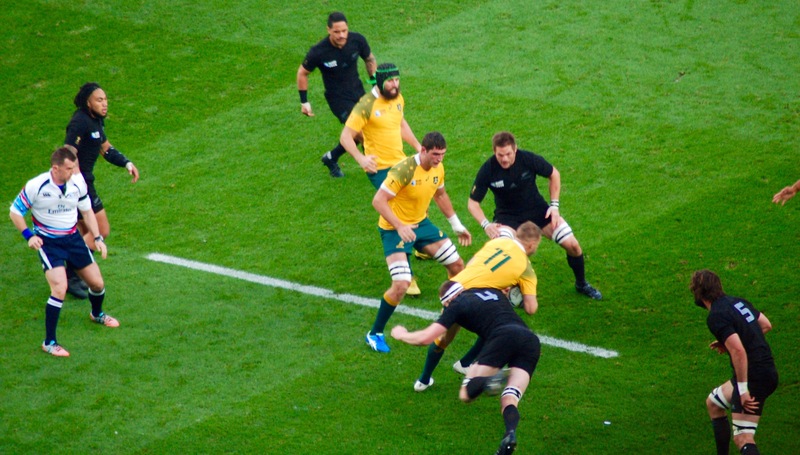 He is reaching over an Aussie player in this picture, looking up at the ball carrier. Before we left London, Kathy asked if going to the Rugby World Cup measured up to all my expectations — a question that surprised me since I thought the giddy smile on my face for eight weeks made my delight obvious. Let me count the way, m’lady. Thirteen international rugby matches. Theater seats for London and Stratford-upon-Avon shows. Hiking the hills, punting the river, browsing through every sort of attraction covering history, art, religion, architecture and others realms of human achievement. Yes, a definite success and then some. Then we decided over a restaurant meal to break it down: list the top five favorite things we did while in England. We both ticked off five before the waiter got the first glass of water to the table. We were approaching more than 10 favorites apiece before our order was taken. In keeping within the rules of naming only five, I tried to do categories, so that one of my five choices was “the rugby games,” another was “Oxford colleges,” another “plays.” Cheater, cheater, Kathy protested. Scotland vs. Australia in the quarter final: If you take the measure of excitement generated in a game by how many times the lead changes, this match goes right to the top of the list. Four lead changes. Australia took an early lead, but Scotland took over for most of the first half and was ahead by one point at the break, 16-15. The teams were never more than eight points apart and most of the time were within three points of each other. Australia got up early in the second half until Scotland climbed back up to a 34-32 lead with under seven minutes to go in the game. Then came the bad call from the ref, a three-point penalty kick by Australia with less than two minutes left and that was the end of the tournament for Scotland. New Zealand vs. Australia in the final: How can the culminating game of the tournament not be No. 1 on this list? It probably would be if the Scotland-Australia match hadn’t been one that had me jumping out of my seat and endangering my laptop on the media table in front of me. The final threatened to be a boring, let’s-play-it-safe, penalty- kicking affair through most of the first half. It wasn’t until the clock had ticked off more than 38 minutes that New Zealand put together a thriller try from the back of a loose ruck with Aaron Smith getting two touches and then skipping a pass to “he’s everywhere!” Richie McCaw, who made one more pass to put Nehe Milner-Skudder in for the score. The All Blacks got up 21-3 and it was starting to look like a rout until Australia put together two converted tries and pulled within four points. All Black Dan Carter stomped on the Aussie momentum with a drop goal at 69 minutes. Every winning team needs a player who can perform this score-from-anywhere-inside-the-50 tactic. Nothing is so soul-killing for a team to be scored against this way. And Carter wasn’t done. He added a penalty kick at 73 minutes and all that was left to complete the game was a mishandle by Australia, kicked ahead by Ben Smith and a bounce up into the hands of Beauden Barrett for one more New Zealand score and a conversion by Carter. 34-17 All Blacks. The other quarterfinal — South Africa vs. Wales: Another close one. Most of the scoring came on penalty kicks, but the tries turned the fortunes of the game for both Wales and the Republic of South Africa. It went like this: 3-0 RSA, 6-0 RSA, 6-3 RSA, 9-3 RSA, 10-9 Wales (nothing like seven points from a converted try to get you back in the game), 12-10 RSA, 13-12 Wales (drop goal by Dan Biggar gave the Welsh the halftime lead), 16-12 Wales, 16-15 Wales, 18-16 RSA, 19-18 Wales, 23-19 RSA (nothing like five points from a try to get you the win). RSA 23, Wales 19. Canada vs. Italy: Canada got up 10-0 to start the game, which included a try by DTH van der Merwe, who scored in all four of Canada’s losses. Owen Slot, chief rugby correspondent for The London Times, named him to his all-tournament team this week saying “his try-a-game tally showed consistency and the try he started and finished against Italy was outstanding.” Yeah-yeah, as the English say when in agreement. Too bad Canada couldn’t finish one more of some great movements. That would have given them at least a tie. But Italy won, 23-18. Canada vs. Romania: Canada again? Yep. For an exciting game, it’s hard to beat a 15-point comeback. Just too bad that it was Romania coming back for a 17-15 win. You can’t look away from the train wreck and you don’t want it to happen, but you have say afterwards that it was exciting. Posted on November 7, 2015 November 7, 2015 by jbsaulPosted in Rugby, SportsTagged All Blacks, Australia, rugby, Rugby World Cup, RWC, South Africa, Wales. Next posting needs to be about your other categories and their lists. I have thoroughly enjoyed this blog and the reminder of why I loved following rugby while in college.